A fter passing Rizal Park while walking north on Roxas Boulevard — which was choked with traffic — I turned right at the next corner onto Padre Burgos Avenue; and then I headed north at the next intersection on Palacio Street. Palacio Street then becomes General Luna Street; and not long after that, I see the bridge with the faded sign indicating that I was about to enter Intramuros — also known as the walled city — which is the oldest district and historic core of Manila. The entrance to Intramuros on General Luna Street. Photograph ©2014 by Brian Cohen. Just beyond the overpass, I look to the right on Muralla Street; and I see a long ramp indicating the entrance to the top of the wall which surrounded Intramuros. Muralla Street. Photograph ©2014 by Brian Cohen. I head on up the old stone ramp, which had moss covering portions of the stone guard rail on one side and a weathered worn wall of stacked stones on the other. As soon as I reached the top of the ramp, I instantly realized that the wall offered a perspective of Manila not seen on the ground. I intend to show photographs of life in Manila as seen from the wall in a future article. Interesting architectural surprises await visitors at what seem to be around every corner of the wall. The wall towards San Diego Gardens was closed as indicated by a sign with the words NO ENTRY crudely scrawled on it, hanging by a haphazard array of cables tied nonsensically. Like an alien life form, the moss and weeds slowly reclaim the neglected marvel whose construction began in the late 1500s. …yet the walls continue to be covered. …while the floor of other parts of the wall were well worn, its surface concave from years of unforgiving weather and trampling by the countless feet of humans. The stagnant water from a past rain of a now-distant storm was cradled and held in place by the mortar between the stones. The avoidance of tripping on the mortar edges became both a sport and a preventative measure from falling on to the hard and uneven surface. …or a peek at the architecture and everyday life of the citizens of Manila. Hundreds of old Spanish roof tiles lay in piles, broken and faded like the heart of a dejected and lonely person, neglected and forgotten. …and it was tough to walk this part of the wall without stumbling on the uneven stone floor while avoiding puddles which had not yet evaporated from the heat of the afternoon. Below is a good shot of what appears to be a good shot. …fort what it is worth. It is interesting to see life milling about beyond the wall below; but there are several different access points to the wall. 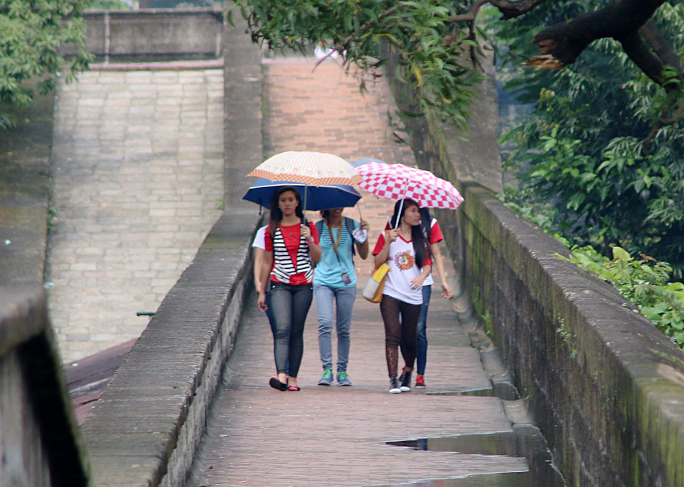 Some parts of the wall are shaded by the nearby flora; while other parts are completely exposed to the hot sun — hence, the use of umbrellas by some of the people of Manila. Sometimes you have to watch out for hazards while walking on the wall — such as the very low hanging wires in the photograph shown below. Walking along the top of the wall which surrounds the quarter square mile of Intramuros while exploring and getting your exercise is recommended by me — it will not cost you a single Philippine peso to do so — and you should not visit Manila without doing so yourself. Intramuros is a great place to explore. The interior has a lot of history lessons and the site of the Japanese atrocities is still fenced off and preserved. I like that they have converted what used to be a moat into a golf course. If you wanna do this in a more fun way, join Carlos Celdran’s walking tour of Intramuros (the walled city).